Last Friday, A. and I spent nearly an entire day on the other side of the river, and I think he would be disappointed if I did not mention that we attended several of the complimentary activities. 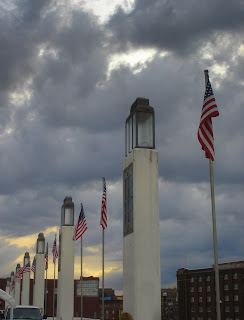 He even suggested that I use "Kids" as the 'theme song' for this blog, as it turned out to the be a leitmotif that day. The first time we heard it, I believe, was when I was driving us into town. A. reached over to turn the volume up, and my fingers repeatedly tapped out the melody on the steering wheel. "Who is this?" he asked. "I'm going to guess MGMT," I said. "It sounds like them." Sounds like them? Of course it was them; the sounds were tautened and expanded, vocals pitched up an octave. The keyboards were turned into sleazy synthesizers. Even elements of the original filter through what some would call a digital haze. "How do they come up with that?" A. questioned. 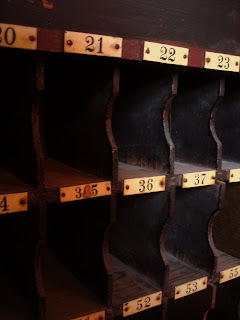 This is a picture of some old mailboxes that were in the lobby of the Blue Barn. We headed over to the Durham Museum (previously the Western Heritage Museum) next. 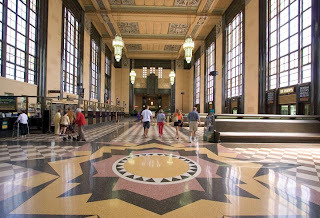 Once a Union Pacific Railway Station, the building used to play host to around 10,000 travelers and 64 trains a day in the 1930s. Once Amtrak--the government's effort to consolidate passenger rail traffic--became 'popular,' the station closed. (The tracks behind the museum, however, are still frequently used. In the time that A. and I were in the area, we several Union Pacific trains go by.) Today, the architecturally-beautiful museum plays hosts to exhibits that explain regional history, as well as culture and science from days past. There are also trains, real trains--including an engine and a caboose--that that free to explore. Every Christmas, there is a huge tree that is locally grown and cut in order to decorate the grand lobby of the Durham Museum. 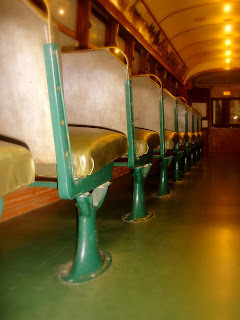 This is the inside of the trolley. Outside, there were thunderstorms around, so I thought I could get a picture of the clouds rolling across the sky in front of the sunset. This picture doesn't capture how beautiful the evening was at all--it doesn't exhibit the breeze fluttering in the air, the smell of the city, the taste of the root beer float on my tongue. Speaking of that root beer, I read later in the Omaha World Herald that within the first hour and a half of the Wild About Omaha festivities, that volunteers at the Durham had handed out 2,000 root beer floats. I would believe it. When A. and I stood in line to receive ours, a worker wheeled out a cart filled with a few layers of empty two-liter bottles of Barq's. I wish I would have snapped a picture of that spectacle. Other events of the evening included a visit to the Bemis Center, a contemporary arts center that provides living accommodations/studios for artists who desire a supportive community, and Hot Shops, a 92,000 square foot art center filled with galleries, studios, and showrooms. There are also three anchor stores: Bruning Sculpture, Loken Forge, and Crystal Forge, where live demonstrations of glass-blowing took place. Of course, no trip to the Old Market would be complete without a visit to some of the shops. 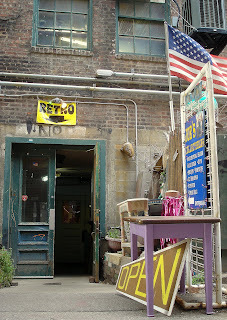 Before we left the area for the evening, A. and I stopped back at "Retro," a store in the alley between Jackson and Jones. (I'm sure that if I mention the store sold incense, polyester pants, and hookahs in the 18-and-over room in the back, you can imagine the vibe of the store.) A. and I did find a few things to purchase, however (minus the incense and hookah). That doesn't mean I didn't have the lyrics to "Kids" playing through my head as I browsed through racks of thick, patterned polyester shirts and fedoras, which I find eternally fashionable.